I'd like to start off this review with the declaration that I am not an artist. I've never taken a serious art class and while I enjoy coloring with the kids, that's about the extent of my art experience. However, when I had the opportunity to review Amazing Crayon Drawing with Lee Hammond , I decided to check it out. I figured we have thousands of crayons in my house so I'm all set as far as supplies go. And maybe I'd find more interesting things than coloring book pages to occupy my time. After talking about materials and providing a very useful palette of all the Crayola crayon colors, Hammond begins discussing techniques, such as layering, burnishing and scratching. She talks about color theory, shading and basic shapes. And then she introduces the grid method, where you use a grid to draw a picture. I've seen this sort of thing in some of the kids' activity books, but I have to say I've never been very good at it. She then goes into chapters about cylindrical and round objects, textures, nature, animals and people. I definitely need to work on making my color application more smooth and even! I plan try this one again and again and again, because Hammond explains that this technique is very important. The next demonstration was to draw a sphere in black. I decided to try this one as well, and thought I did a better job of it, although it still isn't as smooth and even as her sphere. I think I need a sharper point on my crayons! I like the way this book is organized. Hammond explains the ideas behind the techniques before presenting the reader with one of the 29 step-by-step demonstrations to try on their own. She also provides detailed instructions within the demonstrations so it's easy to understand what to do in each step. And she offers some interesting before and after comparisons of pictures drawn by her students using crayons, to show the effects of layering and other techniques. The book progresses from these simple techniques, which I think it will take me a while to master, to drawing rich-looking animals and human portraits in the last two chapters. I cannot imagine that I will ever get that far with my drawing, but I do think I'll get myself a nice set of Crayola crayons that are off-limits to the kids, and a good crayon sharpener, and maybe I'll end up with some nice pictures. I've always found coloring to be very relaxing. 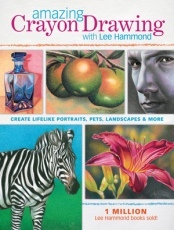 If you enjoy coloring and are looking for something more fun than filling in another one of your kids' coloring books, check out Amazing Crayon Drawing with Lee Hammond. And if you're actually pretty good at drawing with pencils or other media, I'd recommend you try using crayons for a change of pace! Finally, if you have older kids, it would be good for them as well. At age 6, C doesn't quite get the idea of layering and shading, but older kids would. To learn more about Lee Hammond, visit her website. This review was written based on a copy of Amazing Crayon Drawing that I received from FSB Associates in exchange for an honest review. Hard to believe those drawings pictured in the video were made with crayons! Amazing what some people can draw even with the most basic tools. very nice. It goes to show, if you are an artist, you can make art from just about anything. Your renderings are also very good!